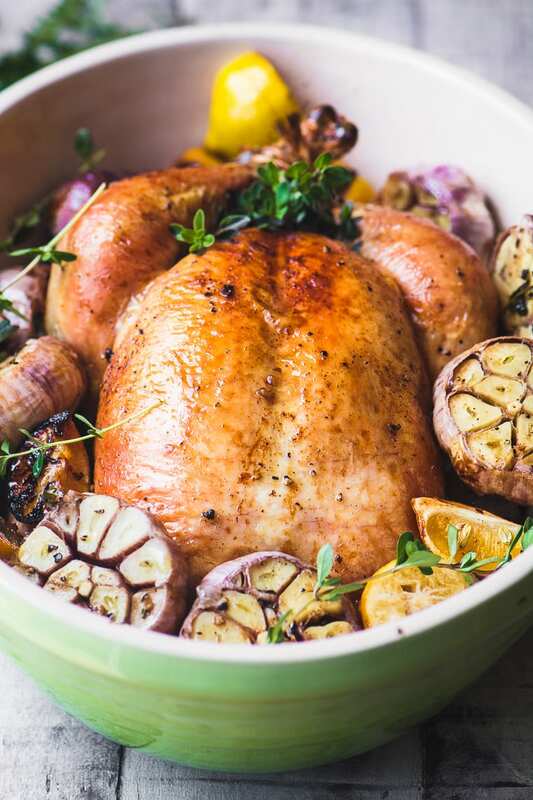 Roast Chicken with Purple Garlic ~ this chicken roasts on a veritable bower of garlic, and when it comes out of the oven, those cloves are mellow and spread like buttah. Put that rotisserie chicken back in the plastic tub, you won’t be needing it. 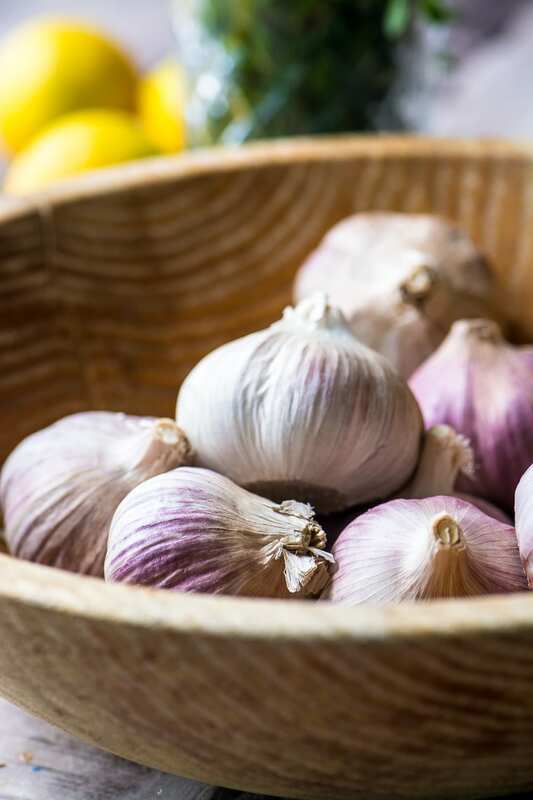 Garlic and I have a complicated relationship… I think it’s harsh when raw, and can overpower other flavors even when it’s been cooked into a dish. But today I’m reminded that a long slow roasting, preferably underneath a chicken, magically fixes all that, and I’m happy to report that garlic and I are now best buds. Yes there’s a lot of garlic in this recipe, but there’s no messy peeling or chopping involved, I just slice off the tops and add the whole heads to the pan. The oven and the chicken drippings do the rest. If you’ve peeked at the recipe and think I’ve gone over the deep end with the garlic, hold that thought ~ remember that it’s inexpensive, and you can use the leftover bulbs in all kinds of ways (that’s IF you have any leftover.) For days afterward we smooshed those golden nuggets into potatoes, smashed them into our couscous, and slathered them on grilled bruschetta. And of course you can always use any extra roasted garlic to make my epic HUMMUS WITH FORTY CLOVES…that stuff proves that roasted garlic makes everything better. TIP: You can sometimes find garlic sold by the bag ~ these tend to be smaller, and a great value, too ~ perfect for this recipe! To prepare garlic for roasting whole, just slice off the tip (the pointy end) to expose the cloves. The root (the flattened end) will hold all the cloves intact. 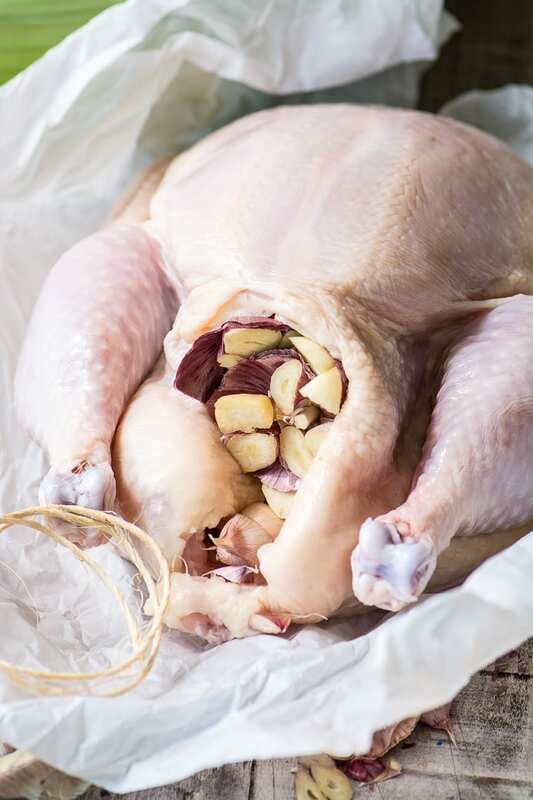 Save those tips, you’ll use them to stuff the cavity of the chicken, so nothing goes to waste. I lined the bottom of my baking dish with the cut heads of garlic. It becomes a base for the chicken to rest on, and will get the benefit of all the wonderful juices that drip down during the cooking. Are you beginning to see where this is going? Yum. Why is my garlic purple? Most garlic is pure white, but there are other varieties. Some are called softneck, which is most common in supermarkets, and others are called hardneck ~ the softneck variety grows on a flexible stem, and the hardneck grows on a stiff stalk. Purple stripe garlic is one of several hardneck varieties of garlic. You can see the small round stalk in the middle of the cloves if you look closely at my cut garlic heads, above. Purple garlic has a purplish striped outer skin, with white flesh, and tastes slightly milder than regular garlic. Purple garlic is supposed to be ideal for roasting. I stuff the chicken with those extra garlic tips and fresh lemon wedges for extra flavor. 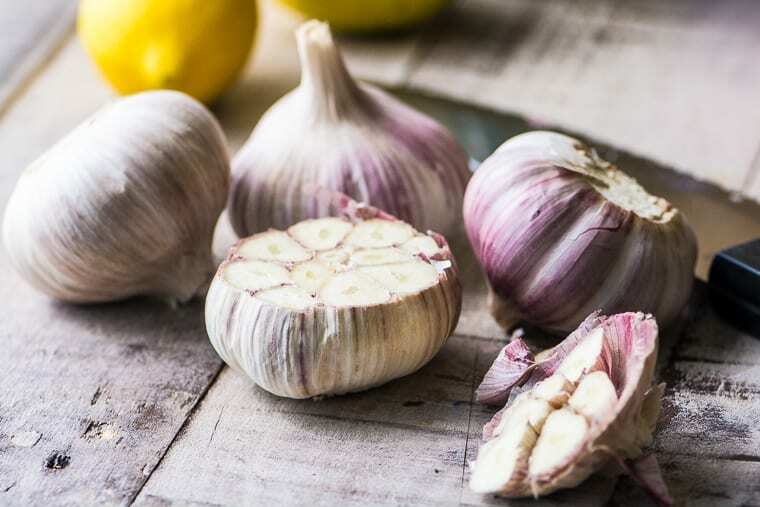 TIP: If you want to remove the smell of garlic from your fingers after you work with it, rub them along your stainless steel faucet or sides of your stainless steel sink when you wash your hands…the molecules in the steel bind with the smelly sulfur molecules on your hands and neutralize the odor, it really works! You can even buy stainless steel ‘soap’! While this isn’t a 30-minute meal, it’s definitely a hands off meal, because, with the exception of a little basting, there’s really nothing to do but enjoy the aromas coming out of your oven. You can serve the chicken right in the baking dish, or on a platter, surrounded by the garlic, it’s pretty spectacular either way. Make sure each person gets their own roasted head of garlic. Now doesn’t this beat that rotisserie chicken in the plastic tub?? I love how rustic and homey my chicken looks when I bake it right in a Le Creuset large stoneware multi-bowl ~ I bake stew in this bowl one day, and use it for salad the next. When I’m not using it for a recipe it sits on the counter holding fruit. This bowl goes from the freezer to the broiler without any problem, and saves space in my cupboard! You can click on the photo for more information. I read my meat packages and buy the best quality, most sustainably and humanely raised chicken I can afford ~ animals that haven’t been treated with hormones or antibiotics, and animals that have had a decent life are better for us in every way. It is more expensive, so I just eat less of it, it’s that simple. Slice the tip ends of the heads of garlic off to expose the cloves. Reserve the loose ends that you've chopped off. Arrange the heads of garlic, cut side up, on the bottom of a roasting pan or casserole just big enough to hold the chicken. Brush the exposed tops with olive oil. Stuff the cavity of the chicken with 1/2 of the lemon wedges and some of the reserved garlic tips (no need to remove the skins) Tie the legs securely together. Rub the chicken with olive oil and sprinkle with salt and pepper. Place the chicken on top of the garlic in the roasting pan. 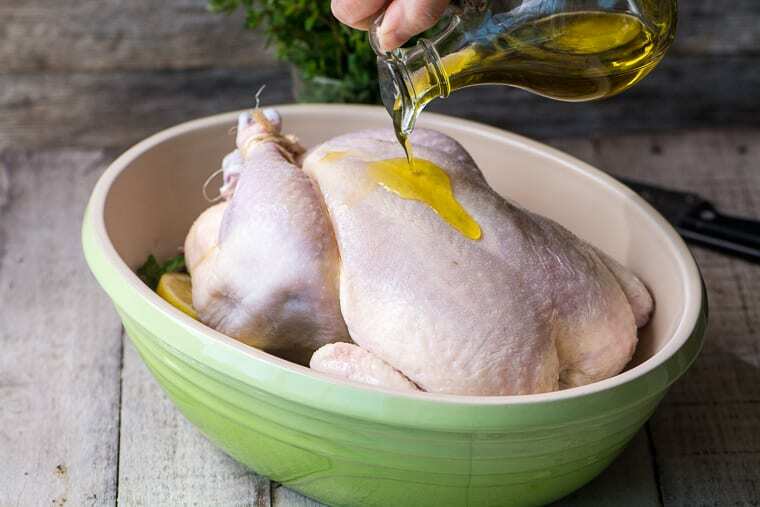 Roast the chicken for 20 minutes per pound, basting every 10 minutes with melted butter or olive oil. Make sure you baste the exposed garlic, too! As the chicken starts to release juices, you can baste with its own juices if you like. If you cut between the wing and the leg and the juices should run clear, the chicken is done. It should be a nice golden brown. You can be sure by checking with an instant read thermometer inserted between the leg and breast, it should register 160-165F. Let the chicken rest under foil for 10 minutes, then slice and serve with the garlic. If you aren’t a garlic lover, you can roast the chicken on a bed of onions, carrots, and potatoes, or any mixture of veggies you happen to love. 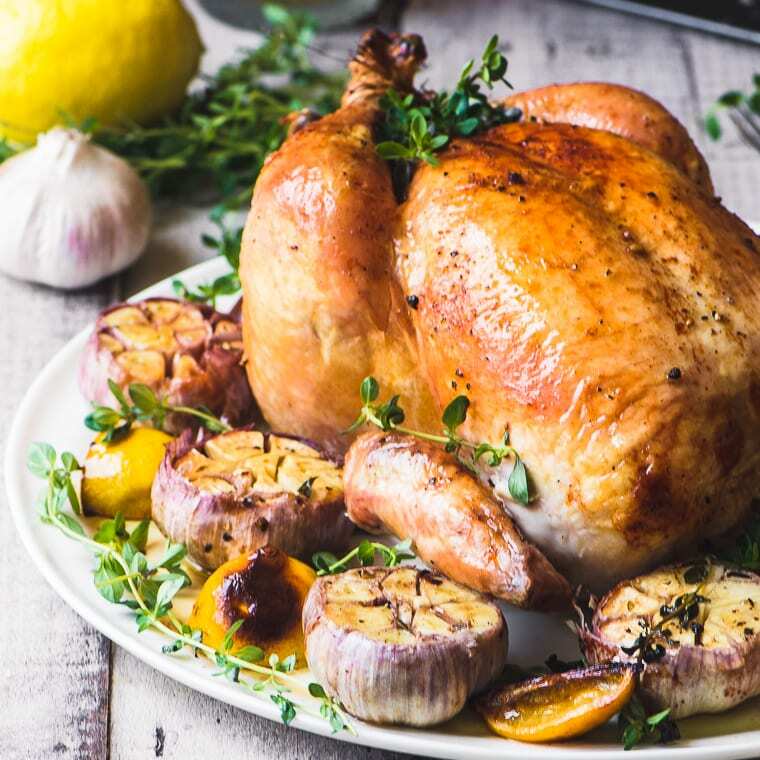 Don’t lose this Roast Chicken with Garlic recipe ~ PIN IT! Hello Sue, i was seduced by ur pic. so i just tried tonight. i cannot find purple garlic here, so i used the normal white one. the chicken is very juicy, and very tender, and the roasted garlic are so decision. only i feel the chicken didnt have enough taste inside. i did put lot salt and pepper, but still the meat is a little bit too plain. what can i do to make it have more taste? maybe the taste of my family is too strong…..
can u help me for some suggestions? except the taste, the rest are perfect. The flavor of the chicken will mostly depend on the quality of your bird, Mezzo, but lots of lemon, salt and pepper can really bring that out. I salt and pepper the inside of the chicken, too, and be sure to stuff the garlic and lemon in, as well. Basting is also important, and you can use melted salted butter in place of olive oil to get more flavor. 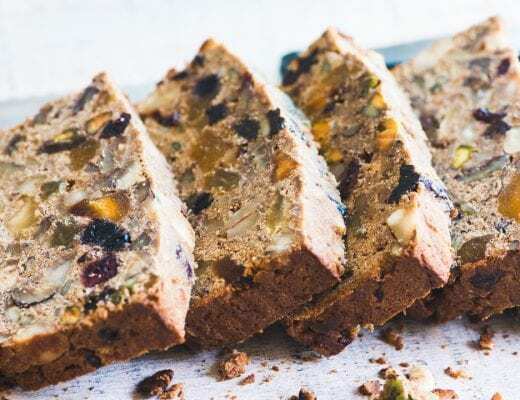 The last thing I suggest is getting a bit of that roasted garlic in every bite, that’s really the highlight of this recipe! Hope this helps. 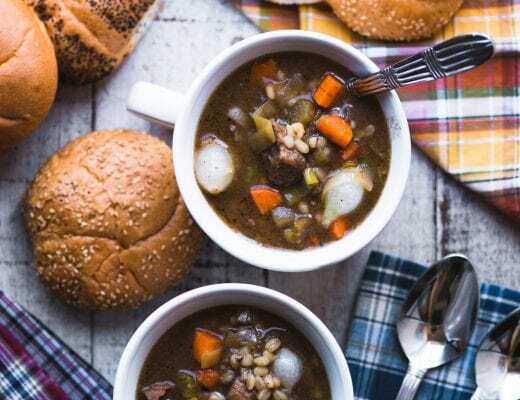 I tried this recipe for my husband for Fathers Day-it came out PERFECT. The chicken was not only flavorful but moist as well. I was hoping for leftovers-no such luck!!!. This is the third recipe I’ve tried Sue from your site, and they have all come out perfectly. Thank you, and my husband thanks you! So pretty! 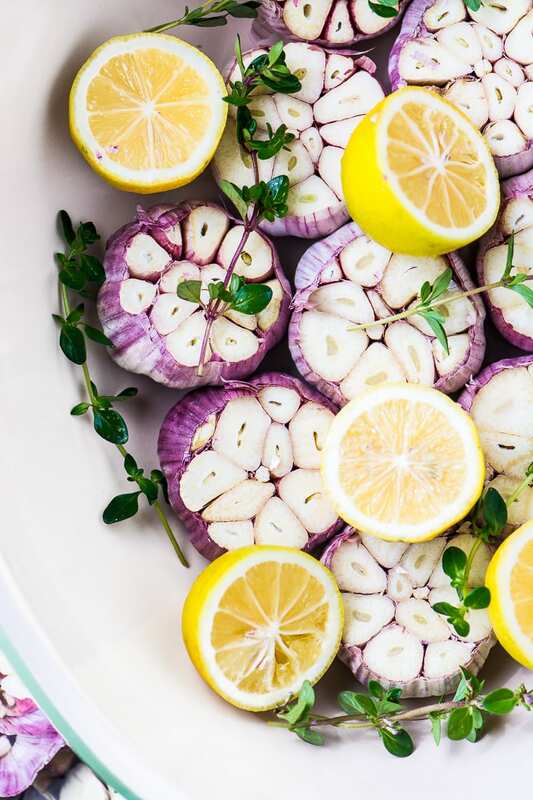 I love the idea of serving each person a roasted purple garlic head. I usually stuff and surround our Thanksgiving turkey with garlic and oranges, but then use the garlic heads to make a gravy (together with the drippings). I have not come across purple garlic before, looks amazing. PS. I own a stainless steel soap bar:) Best thing ever, sits right next to the dish soap. Works after handling fish/seafood too. That’s a great idea to do this at Thanksgiving, Milena, love that! So if I can’t find purple garlic in my local store, would you say I should use less of the regular white garlic, since it’s apparently stronger? Just wondering if I need to adjust the recipe. They’re really interchangeable Renate, so you can use the white the same way. My cloves were fairly small, though, so you might need less than 10 to make a bed for your chicken. I’m the sort of person who questions the integrity of a recipe when it says “1 clove of garlic” – who only uses one clove?!?! – and here you are using 10 heads of garlic. Yes! This is my sort of recipe, putting this one on the to make list, and sharing, right now. And thanks for the tip about getting rid of the garlic smell from your hands – genius! Glad I could inspire you James ~ and if you’re a garlic lover I think you’re going to get a lot of mileage out of that hand washing tip! We grow garlic…..it’s so easy to grow!!!! We have just harvested 3 crates, each 24 x 16 x 6 full. Home grown is stronger and a smaller amount goes a long way. It keeps well all year. Wish you were close enough to share. I saw this on my phone today and gasped out loud at how beautiful it is! I love the idea of all that wonderful roasted garlic as a bonus too. I’m sure the aroma is heavenly as it bakes! Did not know that about purple garlic, good to know. your roasted chicken is such a lovely color, I bet this is fabulous!!! Thanks Cheri, next time you see some purple garlic grab it! Roast Chicken is such comfort food and I can just imagine how good it smells baking with all of that garlic. Beautiful chicken and beautiful bowl. May have to purchase one – as if I need anymore kitchen equipment. Thanks Sue. You’re so right, I talk about healthy benefits of ingredients so often that every now and then I give it a rest ;) But that’s true! 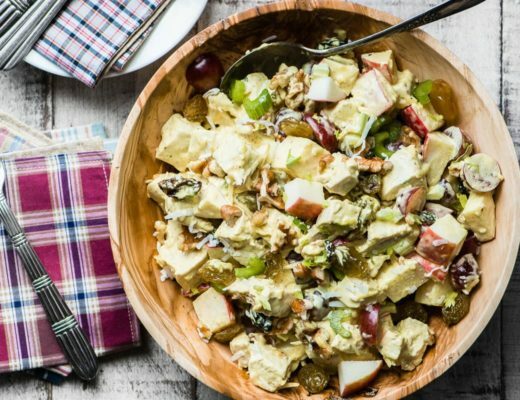 Sue, I made your rainbow salad last night for guests – it’s one of our all time favorites! – and the delicious broccoli pineapple salad earlier this week. Your recipes are always wonderful! This one looks great, too – thanks for sharing each one! Aww the pink garlic, can’t resist buying it when comes the season, I’m loving your recipe! You know, my philosophy is that if you are going to cook with garlic, you should go all in on it. And I have that exact Le Creuset bowl – I’ve never thought about roasting chicken in it! I will have to give it a go! That’s a lot of garlic! I love the stuff, so it’s hard to have too much in a dish for me. And you’re right — it really mellows as it cooks. Fun dish — thanks. I don’t like too much raw garlic either, but roasted, oh my. This is a delicious dish. Love your photos! That is one happy, happy chicken! 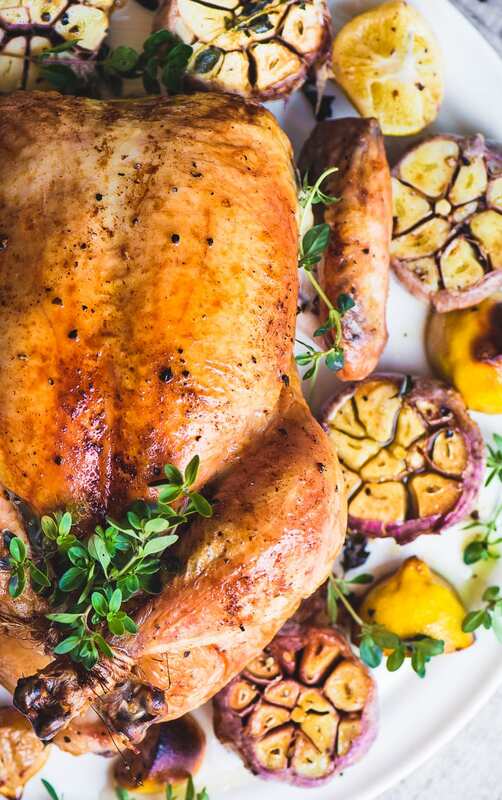 This little bird looks so perfectly roasted, Sue, and those purple garlic are so beautiful! Your house must have smelled heavenly while you roast the chicken. Thanks Angie! And that stainless steel hack is one of my all time favorites, I still can’t believe it works, it’s like magic! 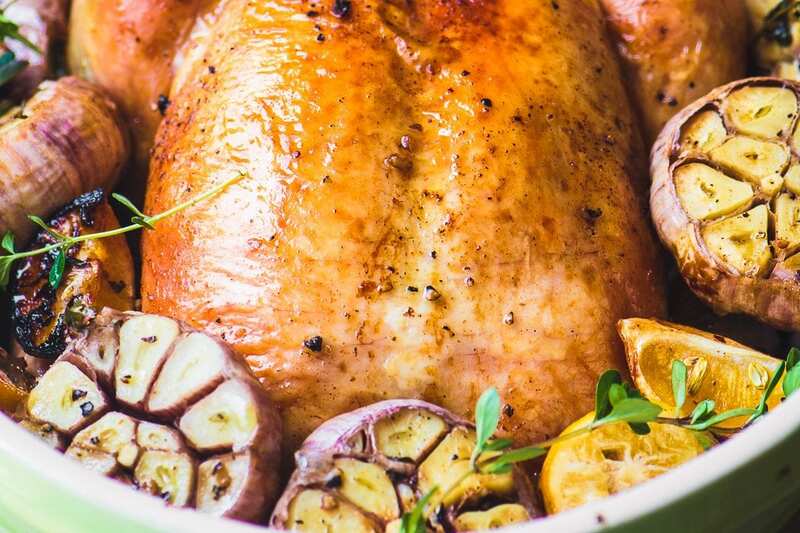 My gosh this is the most beautiful roast chicken ever! We adore garlic and love all the ways you suggest using leftovers. That hummus has always called my name anyway, so out with the grocery store chickens and in with loads of flavor and the enticing aroma coming from my oven! What a great way to roast chicken! I can never have enough roasted garlic around and the lemon must infuse the chicken beautifully :) And left-over cooked chicken is so great in the Summer for salads or sandwiches. Perfect! We never have any leftover, my husband is crazy for chicken and eats it all up ~ I’m going to have to cook an extra just for the leftovers!